This specialised SEO course is a professional diploma delivered by some of the industry’s leading search marketing experts. Detailed and structured modules teach you the elements of search campaign planning, creation and measurement, along with an accredited certification to validate your new expertise. The Digital Marketing Institute is the global certification body for Digital Marketing education. 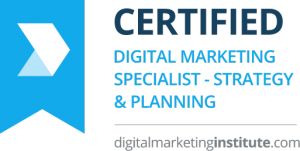 Exclusively designed by practising Digital Marketing professionals, the Certified Digital Marketing Specialist – Search carries the coveted Digital Marketing Institute accreditation and associated brand recognition, which is highly sought after by employers. The certification will provide you with a high-quality, transferable qualification that is developed and validated by the digital industry, and recognised and respected worldwide. This allows you to take your Digital Marketing Institute qualification with you, no matter where your exciting career may take you. The Certified Digital Marketing Specialist in Search Marketing focuses on the planning, implementation and measurement of your search marketing strategy. Anyone can apply for the Certified Digital Marketing Specialist in Search Marketing. A background in a related discipline is not required – the aim of the online SEO course is to allow you to learn everything you need to know about search marketing; and to kickstart a new and exciting career. Upon successful completion of the course, you will become a Certified Digital Marketing Specialist – Search Professional. The Certified Digital Marketing Specialist – Search Professional course is approximately 30 hours of digital marketing course content. The Certified Digital Marketing Specialist – Search Professional course is delivered online. So you can access your digital marketing course content anywhere and anytime you want. This course has no prerequisites, however it is categorised as a Specialised Level course by the Digital Marketing Insititute. Although anyone can take this course it is recommended that you have some exposure to the core principles of digital marketing.